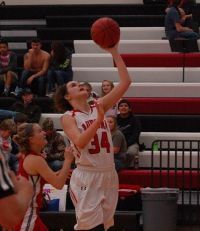 CARL JUNCTION—In a wide open race, the Lady Bulldogs get the nod with the return of conference Player of the Year Brenlee McPherson and junior Lindsey Showalter. They’ve already suffered a loss to McDonald County, but don’t worry. 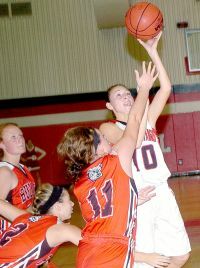 The Lady Bulldogs will only get better as they adjust to new head coach Brad Shorter’s system. Motivation will not be an issue, as only a three-point loss at home to East Newton late last year kept them from grabbing a share of the Big 8 title. And in districts, Shorter’s former team, Webb City, awaits. Seven letter-winners, some great newcomers, and another player returning from injury give Shorter a lot of options to work with. EAST NEWTON—The Lady Patriots are primed to improve on their 5-2 conference mark of last year with POY candidate Kourtney Brewster back in the middle. First-year head coach Erin Rice also has good guard play returning with point guard Emily Brummett, and versatility with forward Koty Cooper. The only glaring possible weakness is depth, as only six lettermen return. East Newton tied for third in the Big 8 last year, and lost its district title game to eventual state runner-up Ash Grove. 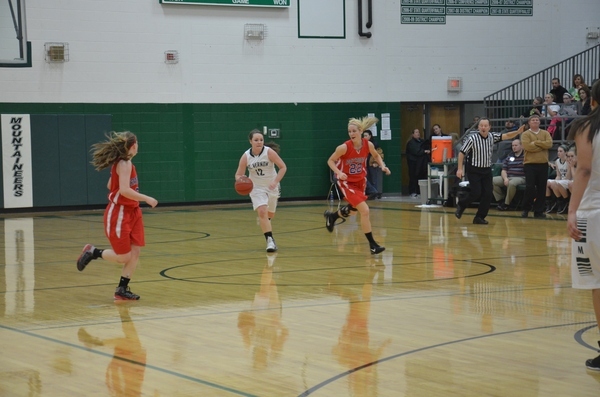 The Lady Patriots have the pieces in place to improve on both of those finishes last year. AURORA—The defending conference co-champs suffered some heavy losses to graduation, with three starters moving on in Baylee Hilton, Erica Tucker, and Jordan Hall. But Aurora also returns seniors Rachel Parker, Lakin Waggoner, Jackie Stephens, Ragain Cline, and talented sophomore Emily Parker. The Lady Houns also get a new coach in Jim Moore who has Final Four experience and brings with him his daughter, Larissa Pyle-Moore, who started at Carthage last year as a freshman. Aurora could very easily top the conference again. McDONALD COUNTY—The Lady Mustangs officially join the Big 8 after going 5-3 against their new conference foes last season. And the new kids on the block are capable of taking the title their first trip through, as they already own a win over conference favorite Carl Junction (in the Carl Junction Classic). Four starters are back from last year’s 16-10 squad, led by All-District picks Preslea Reece and Coley Ickes. The Lady Mustangs will face fellow contenders Aurora and Mt. Vernon before Christmas, but won’t see East Newton or play their regular season game with Carl Junction until the end of the season. MT. VERNON—With the return of starting guard MacKenzie Farmer, head coach Dusty Killingsworth has his floor general back. Mt. Vernon will be motivated to bounce back from last season’s subpar campaign that saw the team go 11-12 and 2-5 in the Big 8. As usual, they will be tested with non-conference games against Springfield Catholic, Fair Grove, Stockton, Carthage, Ash Grove, and Summit Christian in the Crocker Shootout. LAMAR—After having their season come to an end at the hands of the eventual state champions in El Dorado Springs, the Lady Tigers and coach Dale Patton are looking to improve upon their 9-14 record of last year. The bad news is that in addition to sharing a district with El Dorado and Stockton, Mt. Vernon and East Newton have been added this year as well. Having 1st-Team All-Conference and All-District point guard Ryan O’Sullivan should give Tiger fans hope, though. 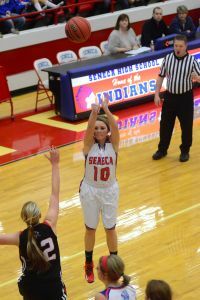 SENECA—The Lady Indians very quietly claimed a share of the conference championship last season. They’re looking to sneak up on teams again this year after losing All-Conference players Baily Skelton and Molli Cooper. Head coach Darryl Harbaugh has six lettermen and three starters returning to make another run, including All-Conference honorable mention pick Mirana Heath. After more than doubling their win total last season, things ended on a sour note with a first round district loss. Seneca will hope to not repeat that this season. CASSVILLE–The good news for Cassville fans is that senior Raeghan Blisard is back from her ACL injury, and the Lady Wildcats have some great incoming talent. Coach Chris Shore’s incoming freshman class was undefeated in junior high and some of them will be asked to step up to varsity right away. The bad news is they are a very young team and it may take a while for the team to gel. If they can come together sooner rather than later, the Lady ‘Cats may be able to start climbing up the Big 8 ladder this year. MONETT – The Lady Cubs have struggled the last two years, winning a total of six games but five of those came last year. Coach Kelly George is looking to keep things moving upward in year three of her tenure, but has to deal with the loss of three starters and a lack of depth on the bench. Seniors Haylee Morris and Kaylee Ticknor will be counted on to give Monett some senior leadership for a young squad. George will look to increase pressure and push the tempo more to increase the Lady Cubs’ win total. Kourtney Brewster, East Newton—Brewster plays much bigger than her 5’9” height in the post. The senior is a defensive stopper and should increase her scoring this year. She is the anchor of this East Newton squad and would love nothing better than a Big 8 championship. 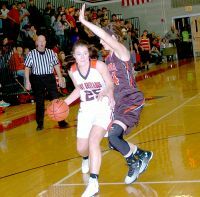 Coley Ickes, McDonald County—Ickes can run a show and knows how to take charge, whether it’s on the softball field or on the basketball court. And the 5’6” senior point guard delivers, posting a 12 point, 3.1 rebound, 3.3 assist, 2.3 steal stat line last year. Her speed and smarts give opposing guards fits. Brenlee McPherson, Carl Junction—The reigning queen of Big 8 hoops should have another big year as a senior. McPherson’s versatility at six-foot makes her a great weapon. 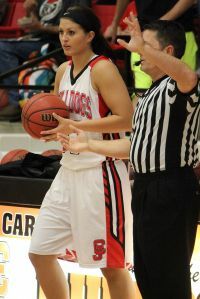 At 12.8 points, 6.1 rebounds, 2.7 assists, and 2.4 steals per game, McPherson is a huge part of the Lady Bulldogs’ hunt for a Big 8 title. Ryan O'Sullivan, Lamar—Another great point guard in the Big 8, the 5’7” senior was a 1st-Team All-Conference pick last year after registering 12 points, four rebounds, and two assists per game. She can do a little bit of everything, including hitting the three. Rachel Parker, Aurora—After being a 1st-Team All-Conference pick last year as a junior, the 5’9” Parker will take on an even bigger role this season with the departure of three starters. That means her 12.8 points per game average should go up as the Lady Houns look to defend their conference title. 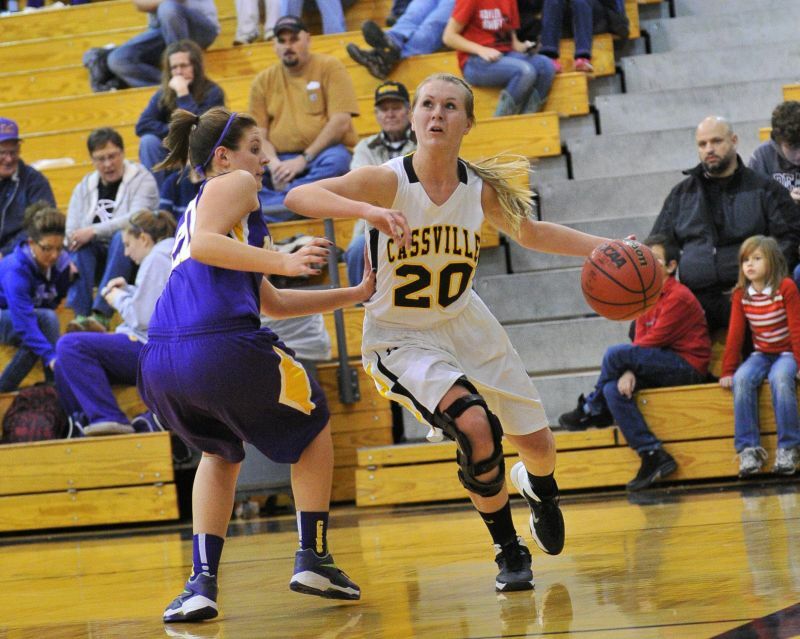 Reaghan Blisard, Cassville—Blisard is returning from her second ACL injury, but the 5’9” senior shouldn’t miss a beat. Blisard makes a difference on the court, going for 10.5 points and seven rebounds a game and giving leadership to a young Cassville squad. MacKenzie Farmer, Mt. Vernon—KiKi is back for her senior year after being sidelined most of last season. A great leader for the Lady Mountaineers, Farmer is looking to get back to her averages of 18 points, 5.4 rebounds, and 5.3 assists per game, and get Mt. Vernon back in the midst of the Big 8 race. Emily Parker, Aurora—Could easily make the jump to the first team this year. And if she does, Aurora could easily repeat as conference champs. The six-foot sophomore can do it all with both athleticism and intelligence on the court and averaged 11.5 points per game last year. Preslea Reece, McDonald County—The six-footer is a big reason (no pun intended) that the Lady Mustangs are contenders in their first year. Not only did Reece have averages of 13 points and 6.4 rebounds last year, she’s versatile enough to play all five positions. Lindsey Showalter, Carl Junction—The Robin to McPherson’s Batman, the six-foot junior’s impact goes beyond her stats (13.3 ppg, 5.6 reb). Showalter is a very smart player on the court and uses her height and athleticism to be a defensive disruptor. Koty Cooper, East Newton—Cooper is a versatile talent who can hit the three, be a force inside, rebound, and do a little of everything. 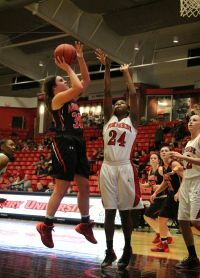 The sophomore should continue to improve her averages of 7.4 points, 3.9 rebounds, two assists, and 1.6 steals per game. Mirana Heath, Seneca—Seneca’s only returning All-Conference player, the 5’5” senior will have to increase her 10 points per game average with the graduation of the team’s two top players. Shania Siegrist, Aurora—A 5’7” senior, Siegrist is a good ball handler, can slash to the basket, and can finish, scoring 9.3 points per game last year in earning an honorable mention All-Conference nod. (18) Mt. Vernon at McDonald County—An early season matchup of two title contenders that will leave one of them playing catch up. The MacKenzie Farmer/Coley Ickes head-to-head battle should be fantastic, as well. (18) Republic at Carl Junction—Carl Junction takes on some of its future COC competition in the constantly tough Lady Tigers. Republic is just one of a number of big names the Lady Bulldogs will test themselves with this season. (26-31) Pink & White Tournament—The Pink & White has seen some excellent Big 8 teams over the years. Aurora, Mt. Vernon, and Carl Junction represent the conference this year. Last season, the Lady Bulldogs went 3-1 to take the consolation bracket, losing only to tournament runner-up Nixa in the first round. COC in years to come. Camdenton, and host Bolivar, which is capable of winning the whole thing. (24) Carl Junction vs Lutheran South—Part of The Scoreboard Guy Shootout at the O’Reilly Family Events Center at Drury, Lutheran South is a young team that went 17-9 last year while playing a strong schedule. Should be a good test for the Lady Bulldogs. (26) Purdy at East Newton—The Lady Eagles return everyone from last year’s Ozark 7 champions and bring some of the best guard play in small school ball in the Ozarks. The Lady Eagles’ speed will make this a great matchup. (9) Aurora at Mt. Vernon—Look at who’s playing. Aurora vs Mt. Vernon in checkers is intense. Add in that both are contenders for the conference championship and it’s must watch basketball defined. (9) East Newton at McDonald County—If you like defensive basketball, this is your game of the year. Both squads can flat put the clamps down. A great matchup of point guards and versatile forwards, this could be the signature game in the POY campaign of the Patriots’ Kourtney Brewster. (12) Aurora at Carl Junction—Will defending champion Aurora hang onto the title, or will the Lady Bulldogs ascend to the top of the heap? The possible future POY Emily Parker will try to one-up current POY Brenlee McPherson. (16) Carl Junction at East Newton—The top two contenders square off late in the season with possibly the conference championship on the line. This game cost Carl Junction a share of the title last season. The Lady Bulldogs won’t want to repeat that mistake. (26) Webb City at Aurora—After the grind of the Big 8 conference season, why not rest up for districts? New Aurora head coach Jim Moore said ‘NO WAY!’ and scheduled the perennially tough Lady Cardinals. The Lady Houns will have one last chance to prepare for a district containing Hillcrest and West Plains.